Recalling the 1st January, 2000…..
Do you remember the dawning of the year 2000? Many who were alive at that time will not forget where they were as midnight approached on the 31st December, 1999. Across the world excitement had been mounting as the twenty-first century drew ever-closer. For quite a few years our attention had been drawn to that much-heralded date – January 1, 2000. Celebrations had been arranged to mark the occasion, and the development of many plans and projects was witnessed. 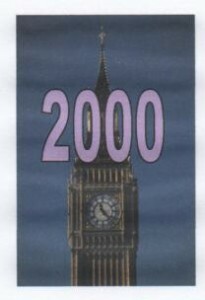 With the unveiling of monuments and the completion of tapestries in Britain, for example, and with the Millennium Dome itself becoming such a landmark on London’s skyline, the intention was that in years to come nobody would forget the arrival of the year 2000. The beginning of a new year is always an occasion for looking back and looking forward. Every year on January 1st we can consider the year that has gone and look ahead to the year that lies before us. But as the twentieth century faded into history, our thoughts went back further than just one year. The twentieth century had witnessed many changes. At the end of the Second World War it would have seemed absurd to talk about man walking on the moon. The first powered flight by Orville and Wilbur Wright had only taken place in December, 1903. But what amazing progress there has been since that time! Of all the centuries, the twentieth has perhaps seen greater changes than any other in history. As we reflect upon the 1900s and also consider the more distant past, we become aware of the progress that mankind has made. There have been remarkable advances in science and technology in recent times and great successes in the fields of medicine and surgery. We must admit, however, that there seems to be a price to pay for progress. Conflicts in Iran, Iraq, Rwanda, Albania, and Serbiacannot quickly be forgotten. What about Afghanistan? The weapons of mass destruction that man has invented cast their dark shadow over the future. Socially, the western world has witnessed the break-up of family life and the erosion of moral standards. Prisons are becoming overcrowded, and violent crime in many countries is on the increase. We realize that in many respects things are not getting better. We hear much about global warming, and the depletion of natural resources, and environmentalists are frequently expressing their concerns. Unusual weather patterns are being recorded, and there have been a number of very destructive hurricanes and frightening earthquakes and tsunamis. While many people long for a safer, happier world, the future hardly seems promising. The millennium celebrations marked one very significant event. It was two thousand years ago, as we count time, that Jesus Christ was born. Although the exact date of His birth cannot be stated with certainty, there can be no doubt that His birth was a milestone! The fact that our calendars are dated from His coming proves this beyond any contradiction. Yet we must understand that He did not begin His existence 2000 years ago – because He is eternal. He “was in the beginning with God,” and, as the Word, He “was God,” (Jn.1:1-2). The Bible tells of how He took upon Himself human form: He “was made flesh, and dwelt among us,” (Jn.1:14). Jesus Christ has made a tremendous impact upon history. This should not surprise us when we consider the unique life of God’s Son. Nobody spoke like He did. Often His enemies tried to trap Him in His speech, but all their cleverness could not match His divine wisdom. “They marvelled at Him,” (Mk.12:17). Mighty miracles marked His life, confirming that He was “approved of God,” (Acts 2:22). He could heal all kinds of sickness, calm storms, feed hungry multitudes, and even bring the dead back to life. His kindness and compassion attracted those rejected by society. Has anyone ever displayed such love? But why did He come? Was it to be an example, to teach us how to live? The New Testament answer is plain: “Christ Jesus came into the world to save sinners,” (1 Tim.1:15). He came to this planet to save us, not by His life but through His death upon a cross. By the sacrifice of His sinless life, He has made forgiveness possible for sinful man. On the third day after His death He rose again and was seen by many witnesses to be alive. More than five hundred at one time saw the risen Lord, (1 Cor.15:6). Forty days later He ascended to heaven before the eyes of His followers promising, as He left them, that He would return some day. The Bible has something to say about the Millennium too – but not the millennium that most other people have been talking about. It describes “the thousand years” when Satan will be bound and thus prevented from pursuing his evil schemes, and when peace on earth will be enjoyed under the reign of Christ, (Rev.20:1-6). Earth’s “golden age” is yet to dawn, when there will be peace and harmony both in the animal kingdom and among men of different nationalities. Prophecies such as Isaiah 11:6-7 still await fulfilment when Christ reigns as rightful king upon this earth and when war will be no more. So much money is spent today on training men and women for war and equipping nations to defend themselves satisfactorily. A day is coming when they will not “learn war any more,” for the “Prince of Peace” will be in complete control, (Isa.2:4 & 9:6). Before that time, however, things are going to get worse. The Bible pictures Christ returning in judgment to a world experiencing worse turmoil than it has ever known at any other time. Much of the book of Revelation is devoted to those last days of terrible tribulation, culminating in the moment when the Lord Jesus appears in flaming fire to take vengeance on those who do not know God and have not obeyed the message of the Gospel, (2 Th.1:7-8). The prospects for the ungodly are bleak indeed. The Lord’s coming in judgment is something to be feared. A different prospect awaits the believer. We have not been “appointed …to wrath, but to obtain salvation by our Lord Jesus Christ,” (1 Th.5:9). Our sure and certain hope is that the Lord Himself shall descend from heaven with a shout – first raising the bodies of those who have died believing in Him, and then catching up those who are alive at His coming. We shall meet the Lord in the air and shall go to be with Him for ever. Truly, there is comfort in these words, (1 Th.4:13-18). Man has the power to destroy himself, and many people wonder how much longer this world can go on. Ungodliness abounds everywhere, and only God’s patience has prevented Him from acting in judgment already, (2 Pet.3:9). Believers sometimes wonder how much worse things will get before God righteously intervenes in the affairs of men. The one thing we can be certain about is that God has His own programme. The Lord Jesus Christ is coming again, and there are many indications from the Bible that His coming is near. Is He your Saviour, or will He be faced as your Judge? The gospel appeal is urgent: “Seek ye the Lord while He may be found, call ye upon Him while He is near,” (Isa.55:6). We must forsake our sinful ways and our sinful thoughts and, in repentance, ask God to be merciful and to pardon our sins, (Isa.55:7). He can – because His Son died in our place when He came to earth. For those who love Him and consider what is happening in the world today, the Saviour’s own words offer great consolation. He said: “When these things begin to come to pass, then look up and lift up your heads; for your redemption draweth nigh,” (Lk.21:28). As we recall the close of the twentieth century and the commencement of a new millennium, we can look back and rejoice that He came. But we can also look ahead and remember that He is coming again – soon.